Call the profile statefulinstall. Right click on it and choose Edit Settings… Select Next and on the Edit Host Profile page uncheck everything. 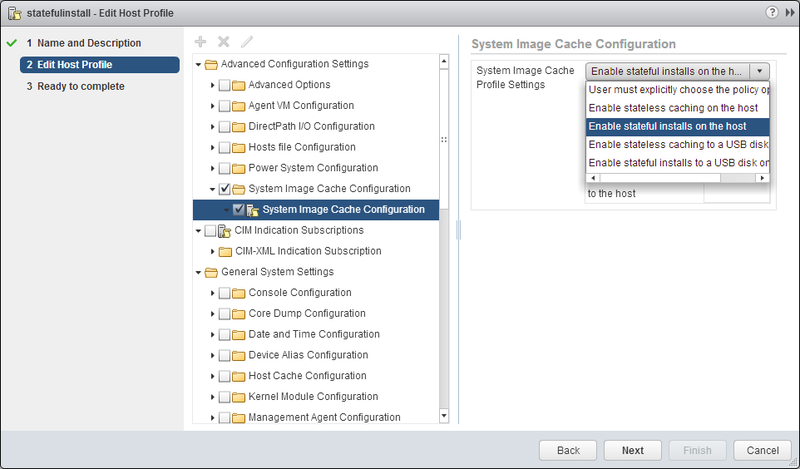 You want to check one and only one box: Advanced Configuration Settings -> System Image Cache Configuration -> System Image Cache Configuration (yes, there are two entries one under the other with the same name). 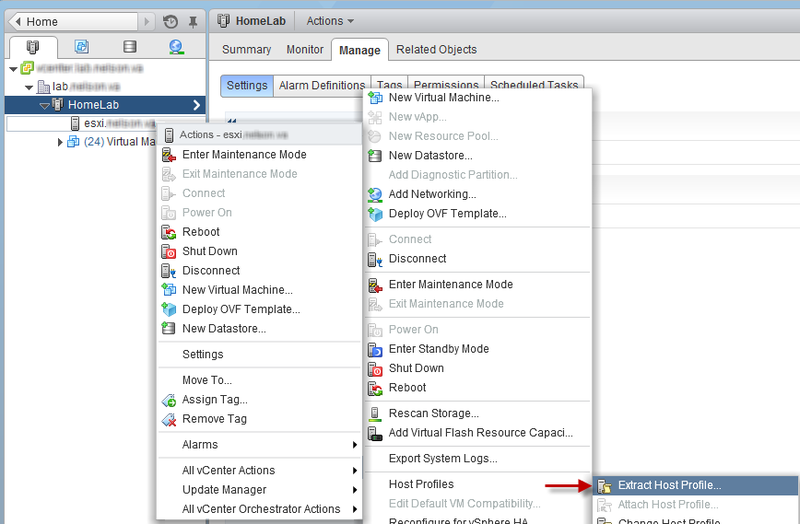 Change the System Image Cache Profile Settings to Enable stateful installs on host. In this example, I extracted from a dissimilar host and ignored all the settings – I just want a host profile that makes an install stateful. This is a gross misrepresentation of the power of host profiles. At the same time, host profiles are extremely reliant on using the same hardware. If there is no reference host matching the hardware of your Auto Deploy’ed host, then stick to a stripped down profile. Attempting to use the full contents of a profile from dissimilar hardware – for example, the profile of my T110 ii on my T320 – will only lead to much cursing and non-compliant hosts. You can get away with selecting some small bits and pieces that are not hardware specific, like NTP settings or the root user’s password, but we’re ignoring those to focus on Auto Deploy here. However, if you do have many hosts with the same hardware, get that reference host the way you want it, extract the profile, and use that profile for Auto Deploy. You could apply your dVSwitch, cluster, iSCSI, and other settings all at once instead of piecemeal. Just don’t forget to set it to use stateful installs, unless you always want it PXE booting! Stay tuned for Part 3 next week, wherein we will conquer Image Builder and finally deploy a host.